Hello! 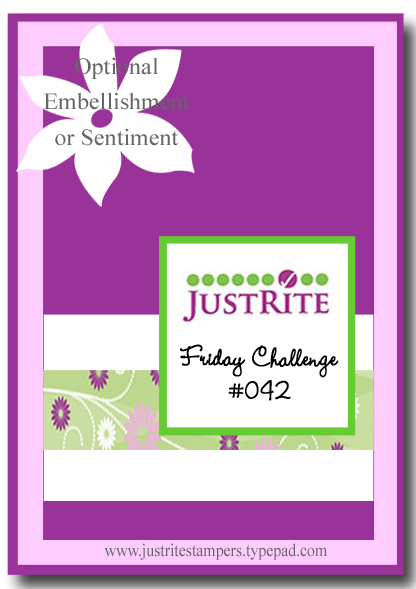 It's time for JustRite Friday Challenge 042! 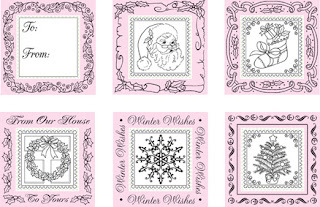 This week is a sketch challenge sponsored by Inchie Arts. Inchie Arts offers three different sizes of the highest quality artist grade matteboard squares: 1” (Inchie), 1-1/2” (Inchie +) and 2” (Twinchie). All of their products are fade resistant, acid free, lignin free and solid core color through and through. The material is designed to receive whatever art medium (wet or dry) you use in your coloring and embellishments - from stamping to watercolors, chalks, inks, pens, markers, stains and more. They are available in black, dark gray, light gray, wheat, dark cream, ivory and white; as individual packages or assortment packs. This was my first time using Inchie Arts products, and I loved working with them! 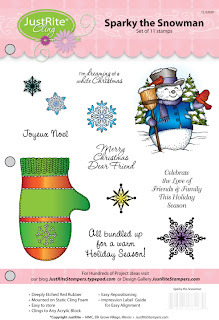 For my sample today, I stamped the sentiment from CL-02020 Sparky the Snowman - Cling onto a light grey Inchie + and heat embossed it with a platinum embossing powder. I popped this square on top of a dark grey Twinchie after stamping a border from JB-09775 From Our House 2" Square and heat embossing it with clear embossing powder. I attached both layers onto a Spellbinders Lacey Square Nestabilities die cut. You can see a bit more of the embossing detail here. I also added some stitching and shiny silver pearls to finish off my card. Be sure to visit the JustRite Inspiration blog for more details on this week's challenge and to see more inspiration with Inchie Arts! Accessories: Inchie Arts Twinchie and Inchie + Squares, Stewart Superior Clear embossing powder, CTMH Mirror Platinum embossing powder, May Arts Satin pleated ribbon, Silver pearls (Pizzazz Aplenty), Foam tape, Sewing machine and ivory thread. This is so pretty Stephanie!! You rocked this challenge, Stephanie! LOVE the embossing, especially the frame! So very nice! Take good care and have a super weekend! This is wonderful and so elegant! So pretty Stephanie! 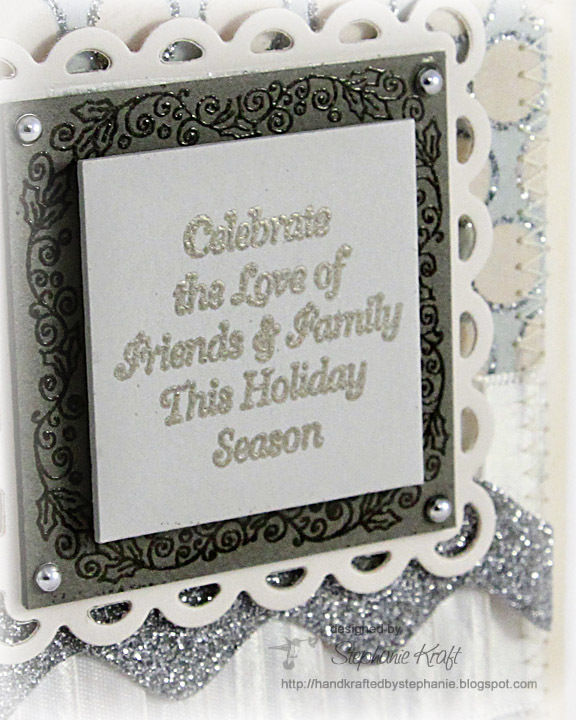 Love all the shimmer, embossing & the lacey square ;) Great inspiration for this week's challenge! 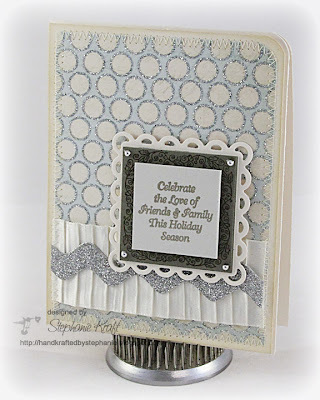 Love your use of gray Inchie products, Stephanie -- combined with all your pretty glittery & embossed accents, it's stunning! This is so elegant Stephanie!! I just love the ruffle, the embossing, the stitching, the sparkle and the zig zag. So much eye candy.